The great Port of Odessa on the Black Sea. It is a major Maritime transportation hub for Eastern Europe and handles a wide variety of products. The city of Kryvyi Rih which contains the largest steel-making complex in Eastern Europe. 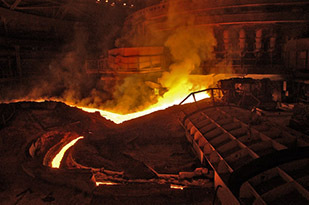 by Arcelor Mittal Steel, the largest steel manufacturer in the World. On site I visited their Coking Plant, Blast Furnace #9, one of their Iron Ore Strip Mines and their Blooming Mill. view series pdf Janos was afforded the rare opportunity to visit the Chernobyl Exclusion Zone. 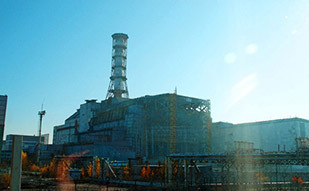 of April 26, 1986, a massive explosion and fire occurred in Reactor #4, spreading toxic levels of radiation over a wide area. a hospital, cultural center, restaurant and cafes, hotel and even a newly-constructed Amusement Park. The park was scheduled to open on May Day, 1986. No one ever rode on the rides. 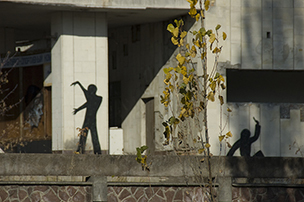 What is striking about Pripyat is the overwhelming silence. Mid-scale images are limited to an edition of 10; Small images are editions of 25.